This afternoon Team Mouri held the last team meeting before the Team heads to California for the start of the 2011 RAAM in 13 days. Almost the entire Crew was there, along with some spouses. After Edgar walked the Crew through the Crew Guide, each of the three crew shifts met separately to discuss whatever was important to that shift. A 32 page Crew Guide may seem like a lot, but it's really not when you consider the logistics of racing 3000 miles. The guide covers everything from crew luggage (1 ea, small), cell phone numbers, crew positions and protocols, crew shifts, starting and finish line details. During the run up to the start, I will be posting about selected bits of the Crew Guide to give you a better feeling for the complexity and magnitude of a RAAM attempt. While shifts were meeting, I went out to watch Randy burn meat on the grill. Once the meetings broke up I was able to meet and chat with team members I knew only by name. Grilled chicken, grilled sausage/brats, four different salads, beautiful weather and congenial company. I could stand more meetings like this one. It's been a while since the Great Eastern Shore Training Event and the participating crew have had some time to recover and think about the event. So here's what two of them them had to say. "It takes a special bunch of people to be able to coexist in small, tight quarters. One thing you can be sure about is maintaining a good sense of humor is the key. Know your position on the team, work together and always remember that Randy's safety first and foremost. No matter how tired you get there is always humor in everything. Remember the funny parts of the trips and training you have completed and repeat them during your time together. Believe me they will get funnier as time goes on." "At the start, while the first crew (two rookies and our fearless leader) was out battling the fish in the road, the A team figured out that there was plenty of room for each member's "small" suitcase, dry goods, etc. ... In addition, our first shift was to be checking out the sleeping accommodations in the RV. Supposed to be. Kind of difficult when some drunk drives up next to us, cuts the engine, gets out, takes a running start, and grunts as he slams in hands onto the trunk of the car and starts pushing it. "Oh, he must have stalled out and is trying to jump start it." But then, he takes a running start, and grunts as he slams in hands onto the hood of the car and pushes it back. And then again the other way. And then back. "Is this some sort of 1:00 am initiation? Maybe a new exercise program to get ready for football? Time to call the cops!" He must have heard us whispering as he jumped back in the car and drove away. "Did that really just happen or are all three of us dreaming the same dream?" You can't make this S^!t up! " As you have read from a previous post, Leo and his wife, Elaine, will be our home base crew and assist us from afar as we work our way across the country. Many thanks Leo and Elaine. I love you both and appreciate your commitment to helping our team keep the readers informed. May 7th, I did the DC Randonneur 300k out of Frederick, Md. I pretty much rode the entire distance with Clint, Bryan and Dan (all SPP members as well). Mike, the fourth SPP rider, started out with us, but being his first 300k held back on his effort level to make sure he had energy for the finish..and that he did. Congrats Mike! This particular ride was a little hillier than OC12 and a good test for my lungs. I was still experiencing congestion in my chest (coughing a lot and heavy breathing), but felt okay on the climbs. Overall feeling a little better, but still not there. Perhaps 85-90%. Again, the muscles were fatigued afterward, but not as badly as what I had experienced coming off of the OC12 ride. A good sign that I am getting better. But RAAM is closing in and I don't have much time remaining before the start. Please extend your patronage to these fine folks when you have the opportunity. And just for fun, tell them that the RAAM guy riding for Habitat for Humanity sent you. I placed an indoor trainer in the back of a pickup truck and planned to spin from opening to closing of the restaurant. I started at 11:15 a.m. and went to 9:30 p.m. (1 1/2 hours early). I didn't stop because I was tired or bored. I stopped because one of the board of directors for Habitat for Humanity, Adam, wanted to buy me a beer. So we shut down the mobile fitness center (donated by our neighbors, John and Karen) and moved inside. As I walked into the main area of the restaurant I was greeted by a huge round of applause and cheering from the entire restaurant. I'd have to say it was pretty cool (I briefly felt like a rock star...very briefly). Beer always tastes better after a long ride and with good company. Thanks again Adam. Many friends showed up enduring the traffic and long work hours. It was nice to see so many of you and even better that I was able to stop a little early and enjoy your company. Thank you all! While I was riding, I met some wonderful folks that passed by and was curious what I was doing. Many people thought I was riding across country in the pickup truck and was simulating the mileage on the trainer. Wouldn't that be sweet (though a little dangerous). I had the opportunity to meet several staff members from the pickup truck. Frank, the President walked up and introduced himself as well as Steve, Rachel and Bobby. They were all very appreciative of our efforts and were ready for a hearty lunch. Meredith has been working closely with Susie and dropped off materials earlier in the day, came by the restaurant later and stayed late into the evening. All the energy she displayed, I think she should sign up for RAAM next year. Great folks working for Habit for Humanity. I'm looking forward to more involvement when I return from RAAM. This latest crew practice on the Eastern Shore was more for the crew than for me. I was still concentrating on getting healthy and arriving at the RAAM start feeling 100%. I'm not there yet, but getting close. As you read from Leo/Elaine's posts the weekend was successful...and exciting! I can honestly say that I have never ridden through a road full of so many fish in my entire life. We only regret not getting video coverage of it all. The water went on and on and on. I kept thinking that the crew was going to start messing with me and play the Jaws theme over the PA. I would only end up riding 231 miles, but the crew practice was invaluable. So what started out as a rookie crew at the N.C. RAAM crew seminar, they have developed into a fine group of working veterans. I could not ask for a better team. Next up is the DC Randonneur 400k out of Frederick, again. I'm feeling better and will likely ride a little harder to further test my progress. Stay tuned! Susie sums up the weekend effort rather well. As you can see, many different talents and abilities are working together to make Randy's RAAM attempt possible. "Randy is on his last loop, not sure of the length. The last piece of the practice puzzle was to have Steph drive during the daylight hours and at night. Edgar drove the RV to get used to it and we wanted to get Ben & Jerry's for the crew. Troy outdid himself with all the food! We really appreciated his amazing effort. Earl did a great job and will be a super addition to the team. We're tired but at the same time energized about Randy having a great race. Like HOS, we learned a lot and are anxious to implement lessons learned. All in all -- a fab weekend!" The whole point of the Eastern Shore weekend was for the Crew to gain familiarity with the processes and procedures necessary to support Randy as he races in the RAAM. This is especially true when it comes to the Follow Van and the RV. The Follow Van is the vehicle that follows closely behind Randy as he rides. It contains his riding gear, lots of food choices (not all of them what you might imagine - I'll try to get a list) and hydration supplies. The van also carries a rather comprehensive medical kit assembled by Al (aka DOC). We hope we never need items like the Automated External Defibrillator (AED). The RV serves as Crew bunkhouse, Team mess, and (if needed) Medical station. The Team rented an RV identical (we hope) to the one we will be picking up in California for the weekend so everyone could become familiar with it. Until this weekend, none of the Crew had seen the selected RV much less packed, driven, or maintained it. It is very hard for a Crew member to visualize just how much room they have been allotted for clothing and personal items. Being able to actually see the room available makes everything concrete. As you can see from the picture, the Crew practiced important tasks such as draining the holding tank. One wonders if they practiced filling it as well. But we won't know for sure; they won't tell me. How the heck... Ah ha! The Crew has been sending me some terrific pictures from the road. Unfortunately, I've not yet figured out how to include them. As soon as I do, I'll add them to the posts as appropriate or maybe just set up a Gallery section or something. Please be patient with us as we work out the kinks. Thanks. UPDATE: Ah Ha! It's amazing what a simple web search will turn up. Posts will now contain pictures if available/safe for work (SFW) :-). When last we heard from Team Mouri, the Great Eastern Shore Training Event was rain/traffic delayed. Randy and Crew did not get going until 0015 RT (RAAM time). Randy has been riding for the last six hours and, by the time this post is published, will have taken a nap. Although the area the Team is working in is fairly flat, it has it's own challenges; deer, fox, and fish in flooded roads. To quote Susie "rode thru 1-2 feet of water on the roads. Saw jumping fishes, could feel the fish in the water. Red fox, deer. Amazing!" It turns out that the planned Crew assignments got all mixed up. Earl needed practice time driving behind Randy in the dark. This is Troy's home stomping grounds, so he set and is now revising the course. Randy's brother Rich is developing a cue sheet for the other shifts on the fly. Adapting and improvising. A note about time used from here on out. During the RAAM all time is kept in "RAAM time" which is equal to Eastern Daylight Time. The standard notation for RAAM time is to use a 24hr clock as it reduces the possibility of AM/PM confusion. So 0015 means 15 minutes after midnight RAAM time (EDT). This weekend is a training weekend for all the elements of Team Mouri. Randy, of course, is riding. The Crew has a number of tasks on their plate. Since the HOS 500, the Crew has reorganized a bit, moving people to different shifts, and adding a new member (Hi Earl!). Thanks to traffic and wet weather, things have gotten off to a slow start. It is now well after dark, raining intermittently, and (at last report) they had not gotten to the nominal start point yet. Time to Improvise, Adapt, and Overcome (to borrow a motto). One of many things we learned during the HOS ride is that the Crew is much too busy to successfully blog from the road. Randy, of course, is riding which brings us to the part of the crew that stays in one place. That's me, Leo, and Elaine. Our jobs are to keep you informed of what is going on as Randy and his Road Crew make their way across the country. Basically, here's how it's supposed to work: 1) Crew comes off shift and texts/calls/emails us with notes about cool/bizarre/normal things that happened that shift. 2) We post to the blog (cleaning up spelling and cussing). 3) You read the blog and perhaps even post comments we can send back to be read to Randy as he rides along. During this coming weekend's training ride on the Eastern Shore we're going to be practicing. The Road Crew will be practicing hand-offs, driving behind Randy in the dark, and calling/texting in at the end of each shift. Here at the commo shack, we'll be posting any news that's fit to blog (and we have not yet determined what our standards will be - they may be terribly low). Wish us luck! What in the Heck has been going on???? Well after the HOS 500 and the Middletown 300k, I came down with the flu (or something) the following Thursday. I did not get on my bike for 16 days with the exception of one Monday spin class. What horrible timing. I lost over 1,000 training miles and a great deal of fitness. 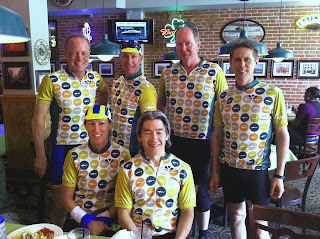 I had a scheduled club ride this past weekend with the Severna Park Peloton. I'm a distant member, but they treat me as if I were a local (one of their very own). Great folks and riders with many ride options within their club for all levels. This ride was meant to be a two day event. Day 1 Stevensville to Ocean City (116 miles); day 2 Ocean City to Stevensville (114 miles). Chip Adams, the ride developer, had Sunday commitments and wanted to return early. I agreed to ride back with him that evening. For me it was a good test to see how I was recovering from my illness. I'm feeling like I'm operating at about 80% right now. I am still feeling good about my chances of being an official finisher for RAAM. I still have 43 days until the start, which gives me roughly 30 days to regain my fitness level, clear my lungs, etc. and be able to breathe normally. It's coming down to the wire here and I'm just hoping to be healthy for the start. I can suffer for 10-12 days to reach my goal. Next up is the DC Randonneur 300k out of Frederick, Md. Only 190 miles, so I may try to squeeze in a little extra, but will see how my body is recovering and will adjust accordingly. Sorry for the lag in posts. There's still a great deal going on behind the scenes. I'm just trying to get healthy right now. Hope to have more updates soon.